Today I collected the dried cannabis from my basement and divided the dried branches in small usable parts. These little parts I stored in an airtight box. Still I have quite some leftovers from the big plants I had. These leftovers I will use to make a cannabis butter, which can be used to make a nice cake with a special effect. The active ingredient of cannabis is called THC and does not dissolve in water. It does however dissolve in animal fat. This is the characteristic we use to make cannabis butter. Make sure you use real butter. Use four times as much butter as the weight of the leaves or plants rests that you want to use. 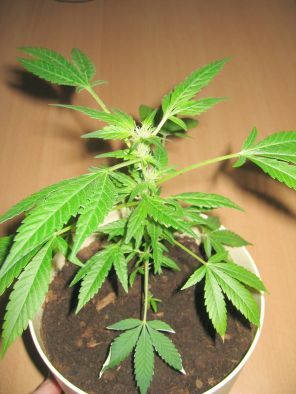 First clean the leaves and the plant parts to make sure it does not contain dust or other contaminants. Put all the leaves and plant parts in a big pan with water and let it slowly cook for about an hour. Add the butter and let it slowly cook for another hour. Now throw the soup through a sieve and collect the liquid in a second pan. Rinse the sieve with left over plant residue with hot water to collect the ultimate parts of butter and collect all the liquid in the second pan. You can now throw away the plant residue. Put the second pan with the liquid in a cold place like the balcony or in the fridge. After a while the butter will solidify on the surface. Probably the butter will be colored differently and appear much more green. After all the butter has solidified use a spoon to take out the butter and store it in a little jar. You can store this cannabis butter up to months in the fridge. 600 grams is the result of my parents cultivation activities. After picking and drying the product is finally ready for consumption. Now only I need to find a market :-). Anyone interested in spending a very long time stoned / high / out of this world? If was time. 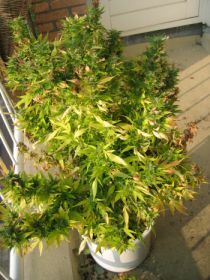 Normally a cannabis plant can be harvested late September or early October, and my plant was no exception. First cut the stems. The cut away all the large and small leaves and only leave the dense tops. Leave these to dry for a month. 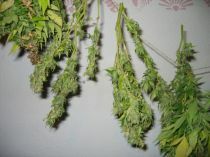 The result was a storage room with a wall full of marihuana and a bare plant ready for the dumpster. 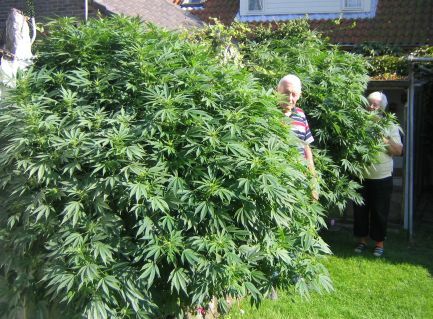 This weekend I will check if the plants at my parents place are ready. Then I will need to think about what to do with a huge(!) 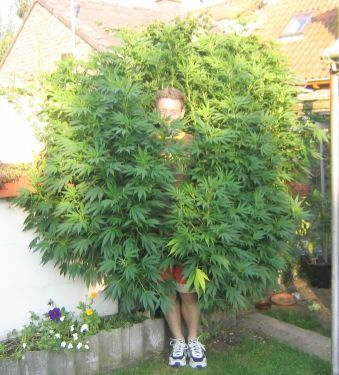 amount of marijuana… anyone interested? The easiest will be to sell everything to wholesalers, in order to avoid any hassle. But it’s also fun to convert everything into tasty cake (or brownies) and by selling these… Oh, I have still a month of drying time to think of something. We shall see. Not all branches are neatly stripped of leaves, because that is a lot of work. Half is done very well and the other half I cut away a bit of the leaves and will clean these up when it they’ve dried. These branches are for experimenting on, and maybe I’ll use them to make some butter. Yesterday I did it. 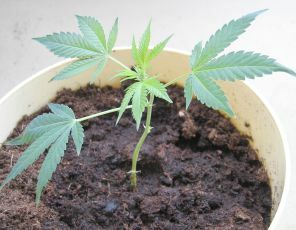 My plant was moved from my window sill to my balcony, because the smell began to be noticeable every now and then. 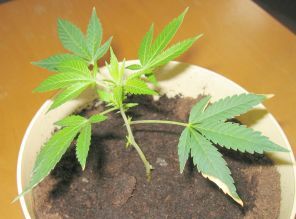 This afternoon I’ll go and check to see how my father’s plant is doing. I had already noticed that it was doing much better than mine. Her trunk was already twice as thick, it is full time in the greenhouse in the heat, and she has a huge(!) large pot with soil. This can only result in unbeatable enormity.